Christmas parties can be so much fun to plan, and attend, but when you have your hands full cleaning your house, hanging decorations and cooking appetizers, table settings can be a small detail that feels like a big headache. All you really need is a beautiful flower bouquet to provide an elegant and pulled-together table that will dazzle your guests. 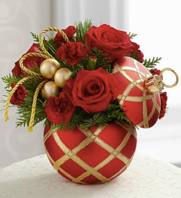 Here are some of our favorite Christmas holiday flower arrangements! 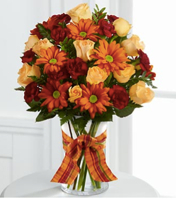 This beautiful centerpiece is a perfect way to dress up your holiday table both for its visual appeal, and its price. Starting at around $30, you cannot get more bang for your buck. This arrangement features white chrysanthemums, burgundy mini carnations and matte gold glass balls, all arranged around a candle to add warmth to your table. 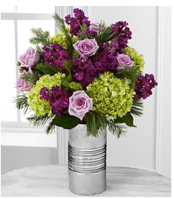 This warm bouquet is an excellent choice because of its dazzling presence, and reusable planter. The flowers featured are red roses and burgundy mini carnations, accented with gold glass balls and gold cording. The reusable container is a festive red ornament, adorned with a gold harlequin pattern. For an elegant and classic holiday arrangement, the Poinsettia is a fantastic option. This beautiful Poinsettia arrangement comes in a stunning gold metallic ceramic container, offering an arrangement sure to please anyone who sees it. Remember, this one is poisonous if eaten by pets! 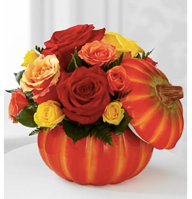 Make things easier on yourself this holiday season by ordering your table decorations!